Bracklin Falls are located to the north of the village of Callander on the Ketltie River. 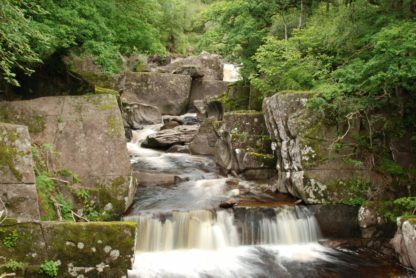 Nearby to the Callander Crags and Stuc a Chroin this waterfall is surrounded by a wooded gorge and provides an ideal destination for a rest on your walk or lunch with a picnic. A viewpoint bridge was installed by hand in 2010 and provides a vantage point to watch the rushing water flow past. A truly stunning sight in full flow the waterfall is best visited after a heavy rainfall.